One night, my husband took my brother out for dinner. Being soy- and nightshade-free, I keep him from going out to very many ethnic restaurants. So they enjoyed a meal at a Taiwanese restaurant. My husband came home raving about the meal he had – and telling me that I might be able to eat it myself. I looked it up online, and sure enough, it was close. It sounded good too. All I had to do was sub out the soy sauce and the red chilies. I knew it wouldn’t be the same, but maybe I could get close and enjoy some enthic food for the first time in a long time. Three Cup Chicken was the meal he had, and I knew immediately that I would love it. Because how could I not love something with that much garlic in it? 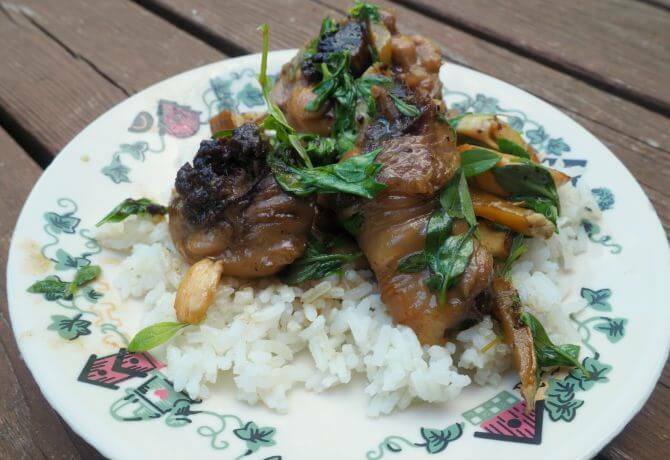 Three Cup Chicken is traditionally prepared by cutting bone-in pieces of chicken into bite sized pieces. I suppose I could have had my husband do that. But if I am going to share a recipe, it better be something I can make on my own. Otherwise, what is the point of me supposedly sharing simple recipes? If you want to go the chopping bone-in meat into small pieces route, be my guest. We did try the recipe both ways, and I will admit that the dish is better when the flavor can infuse into the smaller pieces. Too much work for a weeknight meal, but perhaps a good option for a special occasion. 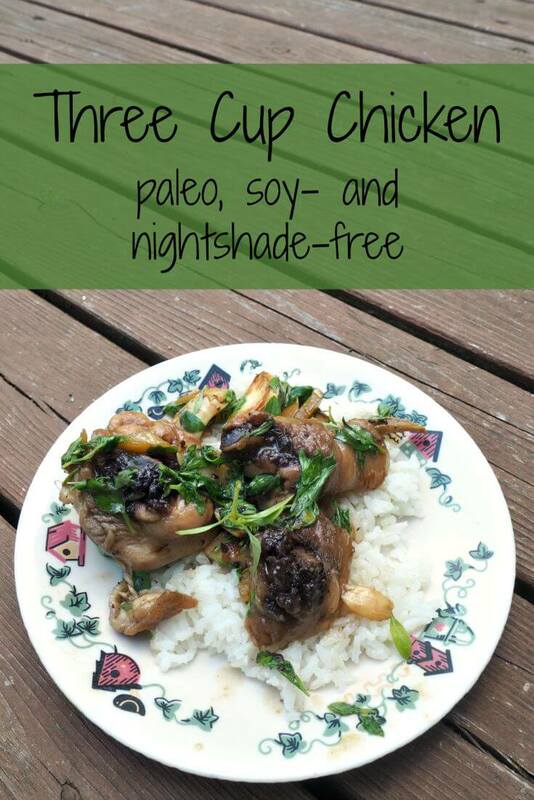 The biggest part for me in making this a paleo three cup chicken recipe was finding a way to replace the soy sauce. I used a combination of coconut aminos and fish sauce to give a really wonderful flavor (or make your own soy sauce substitute). I left the rice wine in, since it is generally considered okay in the paleo-sphere. This does mean that is it not GAPS-friendly, however. I could not find a suitable GAPS replacement. If you have an idea, please let me know! Actually, the biggest part was probably dealing with the chilies. I’m still off nightshades. Since I don’t like super spicy things, it wasn’t critical for me to perfectly mimic the heat of the chilies. But it still needs something of course. I used black pepper and cloves to give some kick. If you can do nightshades, replace the pepper and clove with 3 dried chilies. Having not had the original, I thought this recipe turned out absolutely amazing. My husband enjoyed it, too, although of course it wasn’t a perfect replication. 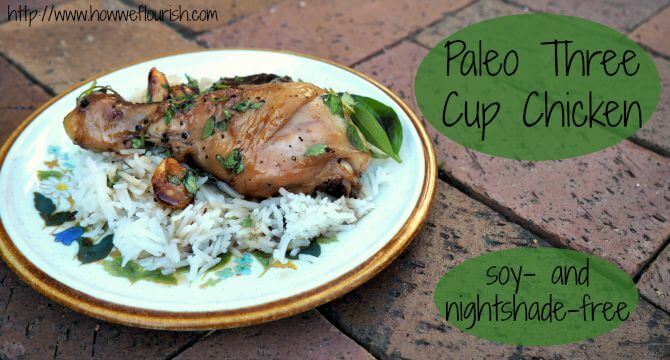 I hope you enjoy this nightshade-free, soy-free, paleo three cup chicken! Heat a large skillet or wok over high heat. Add sesame oil. Add the ginger, garlic, pepper, and cloves and saute until fragrant, about 2 minutes. Add the chicken, and cook, turning occasionally, until it is browned and crisping at the edges, approximately 5 to 7 minutes. Add honey, stir to combine, and then add the rice wine, coconut aminos, and fish sauce. Bring just to a boil. Lower the heat and simmer until the sauce has reduced and started to thicken, approximately 15 minutes. Turn off the heat, add the basil and stir to combine. Serve with white or cauli rice. This paleo three chip chicken is soy- and nightshade-free, but is still full of amazing flavor! Interested in more Asian-inspired paleo dishes? Be sure to check out One Pot Paleo (read my review here) and Paleo Takeout! Wow this sounds awesome! Love all of the flavors, ginger, garlic, coconut amines, thai basil … yum! Thanks! The combination really is great! I love sesame oil – I never use it enough! Looks really good! I had never really used it before, but I really enjoyed it in this dish! I’ll have to make this soon! The only thing I’m missing is the thai basil leaves but I have never been able to find them! I’ve only been able to find them at the farmers market. But I’ve used regular basil in this recipe with success, too.